This is your basic profile information. Account Name is mandatory and all other contact information will be useful but not required. Here you can create levels of access for your users. Sometimes you may want a user to have limited access to things such as viewing or making ratings. Here is where you can create those roles and customize very specific permissions. Click ADMIN > ACCOUNTS > SELECT ACCOUNT > ROLES to determine the different levels of access given to a particular user that can be changed at any time. UNKILLED ONLY – can only view UNKILLED assets and cannot modify ratings. *NOTE: By default, user roles permit color label permissions. If you want to hide this rating for a user role, you must first uncheck the Color Label box under Visible Assets and then also select Hide under Rating Options > Color Labels. Storage Usage provides information on the Storage being used across your account as well as the total amount of Users. You can customize your user interface to include your unique branding. Insert your logo in place of our globaledit logo at the top left corner by uploading it in Admin > Accounts > Customization. Click on the "Accounts" tab under the "Admin" panel and select "Security" from the left-side menu. To enable password expiration, check the box to "Set Password Expiration". Please note, this is turned off by default. You can then choose how often the password expires and how many days before the expiration date to prompt the user to make the change. There are several different metadata schema which you may want to make available to your account. You can select those here, or create a custom schema yourself in the "Metadata" panel at the top, under Admin. Enabling Asset Rights within your account will allow restrictions on the asset and user level. This means that assets can be prevented from being automatically downloaded and instead requested for use. To enable, checkmark the "Enable Asset Rights System" box. By default, any user within your account group (but not in your own account) is considered a restricted user. Disable the restriction to allow all users outside of your account to access assets. Within this page, you can also upload a standard watermark. This will protect your assets. 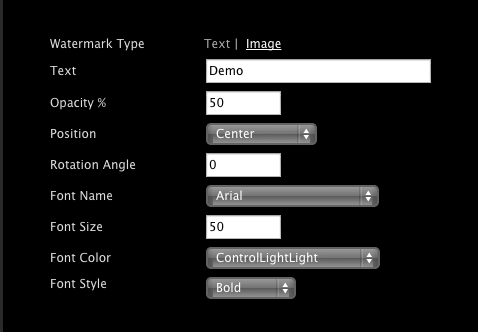 A watermark can be text, customizable by opacity and positioning. Or, you can upload a logo or other image. Adjust the "Rotation Angle" and "Font Size" to get more or less coverage on the image. You can also adjust the options for your account's username watermark, which can be used in Galleries.